Instead, they ended up talking about Brexit, again. That UK lawmakers have spent the last 33 months since the country voted to leave the EU failing to agree on how thrown multiple spanners into the complicated workings of the bloc, whose leaders desperately need to have out unified policies on a number of issues, but instead is constantly derailed by the one member state who, at least in theory, doesn't want to be there. Next month, Chinese Premier Li Keqiang will visit Brussels for a summit with European leaders, before heading for Croatia for meeting with representatives of an organization of 16 central and eastern European countries, just the kind of grouping some fear could be used to split the wider EU. Ahead of last week's summit meeting, the European Commission said that China is simultaneously a cooperation partner with whom the EU has closely aligned objectives, a negotiating partner, with whom the EU needs to find a balance of interests, an economic competitor. in pursuit of technological leadership, and a systemic rival promoting alternative models of governance. " billion in trade between the two parties done every day on average. Crafting a unified policy on how to interact with Beijing is a key issue for Brussels, and one of the EU can hardly afford to screw up. But there is considerable disagreement within the block on how to find this balance, with some members, notably Germany, increasingly hawkish with regard to Beijing, both as an economic and security challenge, while other countries remain eager to embrace Chinese investment. 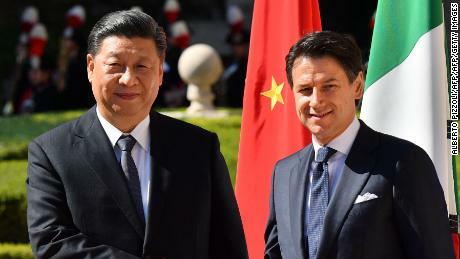 That eagerness was on show in Rome this month, as Italian leaders rolled out the red carpet for Chinese President Xi Jinping, after becoming the largest European economy, and first G7 member, to sign up to his Belt and Road trade and infrastructure initiative. 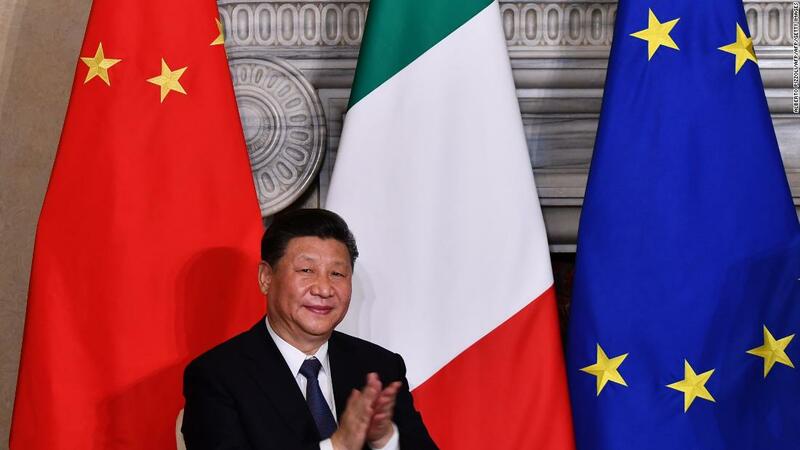 Italy's participation in Xi's project is not only an economic win for Beijing, but potentially creates a wedge for use against the wider EU on key issues in future, said Lucrezia Poggetti, a research associate at the Berlin-based Mercator Institute for China Studies (MERICS). "China is very nobody to deal with EU nations separately, rather than a bloc," she said. "In bilateral relations, China has the upper hand because of its huge economic power compared to individual European countries." She pointed to a move by Greece and Hungary – both key allies of China's on the continent – to water down criticism of Beijing over its behavior in the hotly disputed South China Sea, and Athens' intervention in 2017 to block an EU statement critical of China's human rights record. "In both cases, Greece feared upsetting the Chinese government and potentially losing access to economic opportunities promised by Beijing, so it broke ranks with the EU instead," Poggetti said. "Hungary has also been openly close to China politically." At a meeting in Brussels this month, Chinese Foreign Minister Wang Yi said Beijing "firmly supports the European integration process, firmly supporting the EU in staying united and becoming stronger, and firmly supports Europe in playing a more important role in international affairs. " While Beijing has historically stronger ties with some European countries (and ones with those nations that once invaded and colonized it, a recent and evolving dynamic has seen EU members allying with China in intra-union squabbles. Writing this week, Bruno Macaes, a former Portuguese minister for Europe, warned that China was both used as a weapon at European states seeking leverage against each other, and was exploiting dividends old and new to its own ends. "The problem is that the EU does not have the effective mechanisms to manage serious conflicts between member states, tempting EU nations to call upon external actors to challenge the status quo for them," he said. Particularly, as hostility to the entire European project spreads, affecting not only the UK but also Italy, Hungary and other member states, the opportunities for China to find new partners are increasing. "It's even easier for Beijing to drive a wedge between the EU and Eurosceptic governments," Poggetti said. "The EU needs to prepare for pushback from Italy – an influential member of the EU as a founder of the Union and third largest economy of the Eurozone – on a common European China policy." Brexit is perhaps the ultimate Euroskeptic wedge in this regard. Both European and British politicians have warned that the UK outside the EU could end up with it, rather than ally along the lines of Norway or Switzerland, and Chinese investment and trade will be a key area of ​​competition. A successful Brexit-ed Britain, buoyed by new trade deals with China, could also embrace other EU states to go their own way. Jonathan Sullivan, an expert on China at the University of Nottingham, said the "EU power, such as it is, in international trade and foreign relations, is predicated on acting in unison. " "So if any country wants to make inroads in whatever sector in Europe, try to promote the membership or" pick member states off "and deal with them individually is a powerful strategy," he said. "Beijing has had difficulties dealing with the EU in numerous sectors for a variety of reasons, and the incentive to try to weaken the EU capacity to act in a concerted, unified way, is strong." Macaes and others have highlighted that Beijing is not the only major foreign power seeking to leverage European disunity. US President Donald Trump also has economic and diplomatic carrots for European capitals willing to break with Brussels on areas of disagreement with Washington, such as the Iran nuclear deal. "Trump has tried the method, bashing Germany over defense, long-desired political prizes before Poland and the UK, and lavishing praise on the Italian coalition," Macae said. "Russia is a long-standing but exceedingly clumsy operator. China understands how to insert itself in these debates." Tackling this challenge will require something that has been strikingly lacking from European policy in recent years: Unity. But while external pressure has so far largely fostered greater division, analysts said it could also help drive the block together, as EU member states begin to see the costs of dealing with a player as powerful as China alone, and re-embrace the original purpose of bloc-wide policies. The outside pressure could also help kick long needed reform on just how these policies are made, enabling the EU to benefit all members equally.